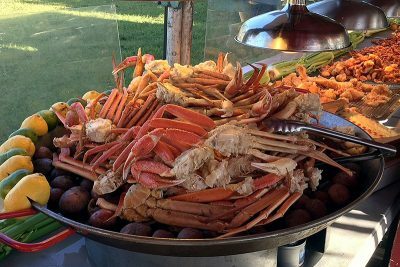 Fish and shellfish are the stars of the annual Ruskin Seafood Festival. But there is plenty of other types of food and beverages to accommodate those not fond of the fruits of the sea. The first weekend in November is just around the corner, and anyone who lives South Shore knows what that means. It’s time for the Ruskin Seafood Festival, the community’s largest and most celebrated event. 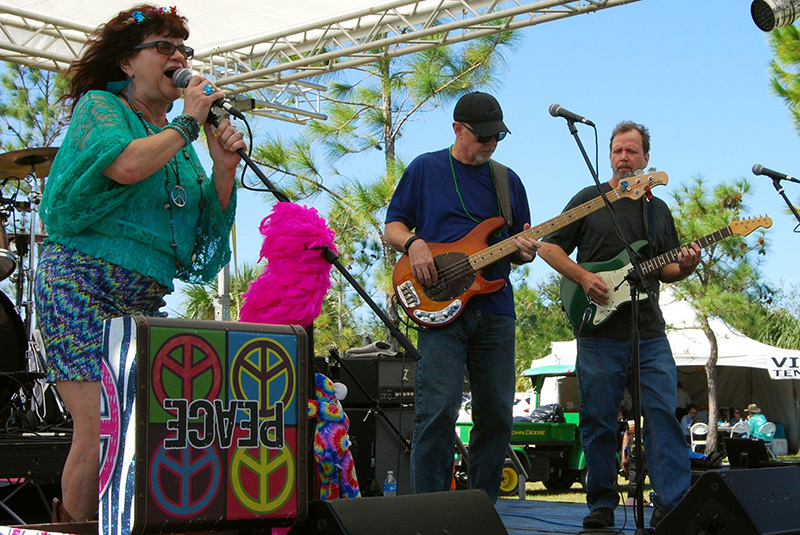 Sponsored by the SouthShore Chamber of Commerce and now in its 29th year, the family-friendly festival draws more than 20,000 visitors from around Tampa Bay. They come to enjoy all things seafood (and other festival foods); cold beer; live music; more than 100 commercial, arts and crafts and nonprofit vendors; its expansive kids’ area, boat show and laid-back atmosphere, where folks can simply hang out with friends and neighbors. The event will take place near the waterfront at E.G. Simmons Park, 2401 19th Ave. N.W., Ruskin, from 10 a.m. to 9 p.m. on Nov. 4 and 10 a.m. to 4 p.m. on Nov. 5. On Saturday, vendors will close at 5 p.m. to make way for evening activities, featuring the Food Court, Sand Bar lounge and live performances by the Spy vs Spy reggae band and Soul Circus Cowboys. Other entertainers scheduled to appear over the weekend are Flamenco Fusion guitarist Luis Garcia, American Song Box, Kozmic Pearl, The Hummingbirds and Randy McNeely. Board member Carrie Elwell agrees. She and her husband, Kevin, owners of Kids ’R’ Kids Southshore, have sponsored the festival’s children’s area for the past seven years and provided the free shuttle service to and from remote parking. “It’s become the biggest event in South County,” she said. “We love seeing all the families who come out and enjoy the park, the food, the music and their neighbors. Those are just some of the reasons the festival continues to grow and has become a family tradition for so many, organizers say. Children can have as much fun as their parents. This year’s kids’ area will feature a bungee jump, rock-climbing wall, mechanical shark, inflatable hamster balls, free face painting by Jumbo the Pirate, pony rides, a petting zoo and more. 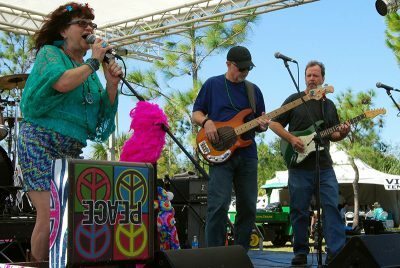 Kosmic Pearl, a popular local band that performs Janis Joplin songs, classic rock, blues and more, will be among a slate of seven groups that will perform at the 29th annual Ruskin Seafood Festival Nov. 4 and 5. Simpson will be honored by festival committee members and chamber board members who will wear tye-dye T-shirts like the one he always wore. And Fagan will be remembered with a special banner hung in the vacant space where his Mullet Shack concession served festival-goers for more than 10 years. Admission is $5 for adults. Kids 12 and younger, active military personnel, veterans with proper IDs and any South Shore schoolteacher or school employee presenting their district IDs get in free. Groups of 20 folks or more can take advantage of $3-per-person rates with advance purchase. Hillsborough County Parks & Recreation charges a $2 per carload entry fee to E. G. Simmons Park. And parking is free. Sponsors of the 29th annual Ruskin Seafood Festival include CMCcare, Apollo Beach Family Medical Center, Direct Family Care, South Bay Hospital, Zipperer’s Funeral Home, TECO and 20 other area businesses. For more information on group rates or the festival in general, visit www.ruskinseafoodfestival.org, email admin@southshorechamberofcommerce.org or call 813-645-1366.